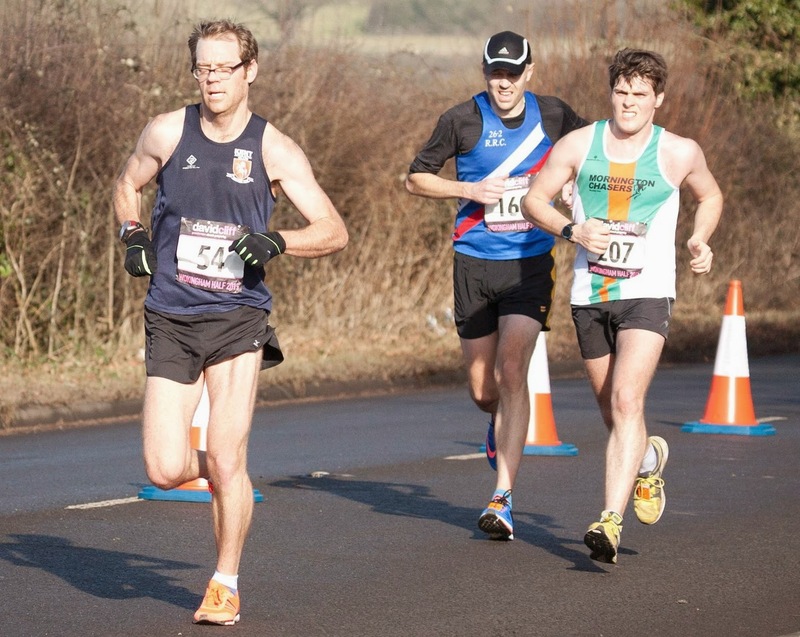 On Sunday I ran in the Wokingham Half Marathon after last years race was cancelled due to flooding on the course. It was my first build up race for what I hope will be a crack at the Berlin Marathon later in the year. I don't think I have enough 'race craft' so I'm keen to slot in a few more races before Berlin so that I have a bit more practise before the day. Before the race I knew that I'd mentally psyched myself out of putting in a good performance. I'm hoping to run two half marathons this spring and I thought this first race would be a training run and the second was where I'd aim for a PB. In training recently people have been commenting on how well I've been running, but I just had no self confidence I could turn in a good performance. Becks gave me a bit of a talking to the night before, which is what I needed. Conditions on Sunday morning were pretty much perfect being cool, sunny, still and dry. It was a little chilly on the start line, but apart from that it was ideal. The start was possibly the most civilised race start I've ever experienced with no pushing or crowding. We lined up at the 1hr 20min marker, but there were barely any runners before us so we (a bit reluctantly) walked forward to the 1hr 15min mark as the start time approached. Surprisingly considering the cold start and the fact I hadn't done a warm up, I felt really relaxed off the start and got into a flow quickly. I realised that I was going faster than I planned to go, but it was a slight downhill and it felt pretty easy so I went with the flow. I completed the first km in 3min 37sec, when I was aiming for 3m 45sec even splits. At the end of the first mile Rich appeared on my shoulder and told me to get onto the group in front. It was a kick that I needed as one of the bits of race craft I wanted to practise was running with a group. Even if the group is running a bit more quickly than you want to go is it worth latching onto them? The group was already starting to fracture slightly. I slowly made my way through three people who were being dropped and got onto the back of the 5 / 6 runners that were working together. I free loaded at the back of the group and didn't help with any of the pace making. I wouldn't say I found it comfortable, but it was do-able to keep with them. Remembering the Marathon Talk interview with Kiwi Rod Dixon I straight lined all the corners and tried to run the minimum distance between bends. It was something the rest of the group weren't doing and it helped me to save a few meters. It was a good psychological boost and much needed respite from the pace. A few times I dropped a couple of meters from the group, but put in a surge to stay with them. I was going to stay strong. I had a mild stitch which I suspect came from taking an energy gel fifteen minutes before the start. I also had a low level desire for a wee. As we started mile seven, a Newbury AC runner who had been hanging at the back of the group with me worked his way to the front of the group and raised the pace. He only raised the pace by 4sec / km, but it was too much for me. As we hit the seven mile marker I cracked. Another one of the group pulled over at the side of the road. It looked like he needed to retie his shoe lace. As the group pulled away they ran through a couple of runners ahead of me who were beginning to fade. I had a decision to make on whether to try and push through those runners as well or to try and join one of them and hope they weren't fading too much. I decided to latch onto a tall guy and hope for the best as I didn't have the legs to do much else. I ran tucked up behind for a km and then he slowed slightly so I led for a km. I then began to really struggle. It was a feeling I haven't had since the Abingdon Marathon. I started to slow and couldn't drive myself on. It was a lot worse mentally than it was physically. The thought of not running a good time after a positive start was, at that moment, crushingly depressing. I wanted to stop and walk. I was never going to run another race again. I was still just about hanging onto the tall gentlemen that I was following. As we approached the ten mile marker the guy who had stopped to tie his shoe lace caught back up with me. As we crossed the mile marker he cheerily commented it was a 10mile PB for him. I was far from being in a similarly happy place. It was grim. I was dropped as soon as we passed the ten mile marker and I was trudging along on my own. There was no longer a prospect that I'd catch up with anyone in front who I might be able to draft. I still hated running. I still wanted to stop and walk. The only rays of light were when I looked at my watch my pace wasn't too bad. In fact it was the pace I'd originally said I wanted to run if I was going to run an even pace for the whole race. It just felt awful. From somewhere I got a second wind. I managed to pump in a relatively quickly km, but more importantly the fog had lifted and it felt easier. I didn't gain any ground on the runners in front, but they didn't seem to be getting any further away from me either. It probably helped that the course was slightly downhill. I wasn't able to calculate a predicted finish time, but I suspected I was still on for a reasonably good time. It started to hurt again as I entered the final mile, but it mentally wasn't as hard as there was no point giving up this close to the finish. I slowed again and the gap to the runners in front began to widen. Four runners, who had judged the race better than I had, powered past me as they finished strongly. I mustered a small sprint finish as I crossed the line. It was excellent to be only five seconds slower than my PB when I was expecting to run around two minutes slower. However, it's a frustrating to get so close, but not better my time! I felt shattered and stumbled over to the kerb for a sit down to rest. It didn't take long to realise that my quads were complete shot. - Getting with a pace group was a good move. It was easier to run the pace when someone else was doing the hard work for you. - However, this pace group was a bit too quick. I wouldn't join a group this far above my target pace in a marathon. - I need to think of some strategies when the going gets mentally tough to drive myself on. - Running the corners and thinking how to straight line the course was a good move. I feel that I should also say that the event was really well run. Lots of friendly and helpful marshals, plenty of toilets and well organised bag drop etc.. The course was pretty good too. The group that left me at the seven mile mark finished around a mile ahead. I'm not exactly sure, but I think the couple of runners who left me at the ten mile mark finished around 30 seconds ahead.